Morphological tampering of cellular architecture is a frequent phenomenon, leading to a spectrum of histological melange at light microscopic level. One such group of tumors which exhibit diagnostic and therapeutic dilemmas are the Clear cell tumors. Clear Cell Odontogenic Carcinoma (CCOC) is an infrequent tumor, which is aggressive by nature among the odontogenic tumors. A case of CCOC of mandible in a denture wearer is presented with the emphasis on diagnostic work up and clarified and unclarified facts of the tumor. Occurrence of clear cell entities in the head-and-neck region is a rarity and among which clear cell odontogenic carcinoma (CCOC) can be considered an enigmatic odontogenic malignancy as there is little evidence on its pathogenesis and behavioral pattern. It is a malignant odontogenic tumor, histologically comprised of predominant clear cell morphology. In spite of having plethora of information from case studies, uncertainty remains with regard to its immunoprofile posing diagnostic dilemmas [Table 1]. Since its first description from 1985 till now, CCOC takes a challenging curve in the process of evolution. 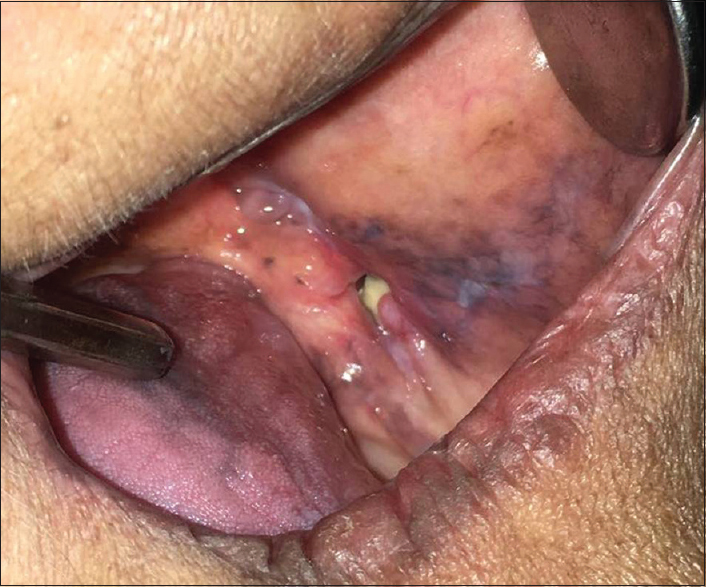 A 72-year-old female patient presented with a chief complaint of pus discharge from the back region of the lower jaw since a month. Associated pain in the left side of the mandible and lower lip for 3 months was noted. It was insidious in onset, continuous, tingling in nature and radiating to the ear. The patient was a denture wearer for 30 years and gave a history of betel nut chewing habit occasionally. Medical history revealed that the patient was a diabetic and hypertensive and on medication for 10 years. Intraoral examination revealed pus discharge from the posterior buccal mucosa [Figure 1]. Edentulous alveolar ridges and other mucosal surfaces appeared normal on inspection and palpation. No regional lymphadenopathy was observed, and routine blood investigations were within normal limits. 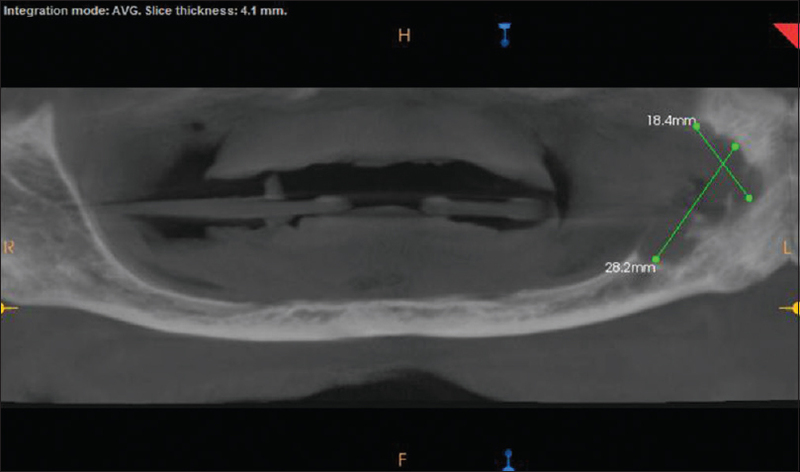 Cone-beam computed tomography revealed an ill-defined radiolucency measuring around 18.4 mm × 28.2 mm in the posterior mandible, extending up to coronoid process [Figure 2]. Bone destruction was seen along with the involvement of the inferior alveolar nerve. 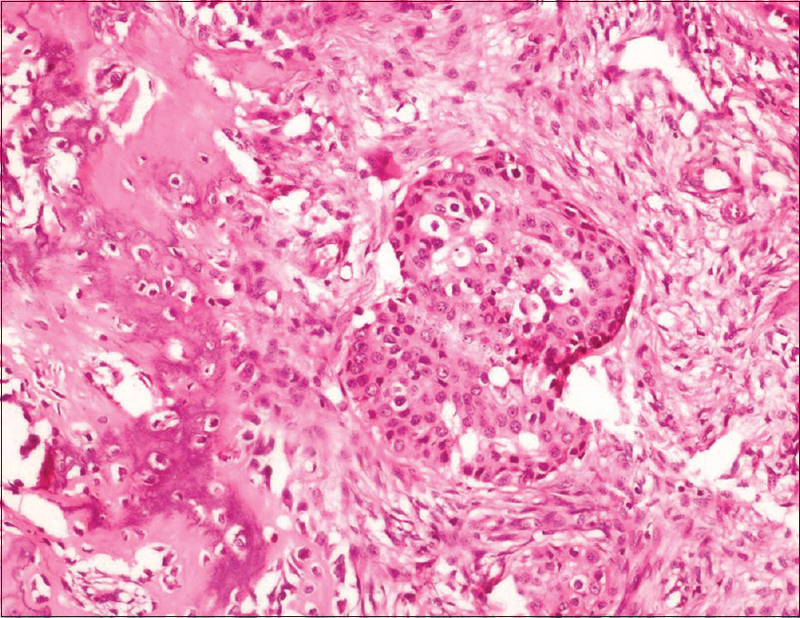 Based on the history, clinical presentation and imaging findings, a provisional diagnosis of primary intraosseous squamous cell carcinoma was considered. Malignant odontogenic tumor, malignant salivary gland tumor and metastatic tumors were in the list of differentials. Pathological evaluation of the incisional biopsy specimen showed predominant clear cell morphology along with islands, cords, pseudo-alveolar pattern and lobules of epithelial cells separated by dense hyalinised bands. Lobules containing uniform cells with clear cytoplasm and few cells with moderate eosinophilic cytoplasm with distinct cellular outline and hyperchromatic nuclei were seen [Figure 3] and [Figure 4]. Mild cellular pleomorphism with rare mitotic activity was noted. Intervening stroma was fibrous and hypercellular with focal giant-cell response. Periodic acid–Schiff stain demonstrated focal positivity for glycogen and mucicarmine and Alcian blue stains were negative for intracellular mucin expression. The diagnosis was suggestive of clear cell tumor, probably of odontogenic origin. The patient underwent lower border sparing marginal resection. Osteotomy cuts were placed from sigmoid notch to the mandible body region, including the lesion. Marginal resection with coronoidectomy was done, inferior alveolar nerve was ligated and cut at the region of mandibular foramen and removed along with the lesion up till mental nerve. Postoperative excisional specimen was looked for architectural pattern, cellular morphology, atypia, stromal features and invasion [Figure 5] and [Figure 6]. Abundant hyalinization around islands was observed. Focal islands demonstrating columnar differentiation with palisading nuclei were noted, providing a clue toward odontogenic origin [Figure 7]. Immunohistochemical staining demonstrated immune reactivity for cytokeratin (CK-19) with the score 3+ in lesional cells and was nonimmunoreactive for calretinin with score 0 in lesional cells. Final diagnosis of CCOC of mandible was established. The patient is free of recurrence after 1.5 years of follow-up. It was first described by Hansen et al. in 1985. It was included in the World Health Organization (WHO-1992) classification as a benign odontogenic tumor. 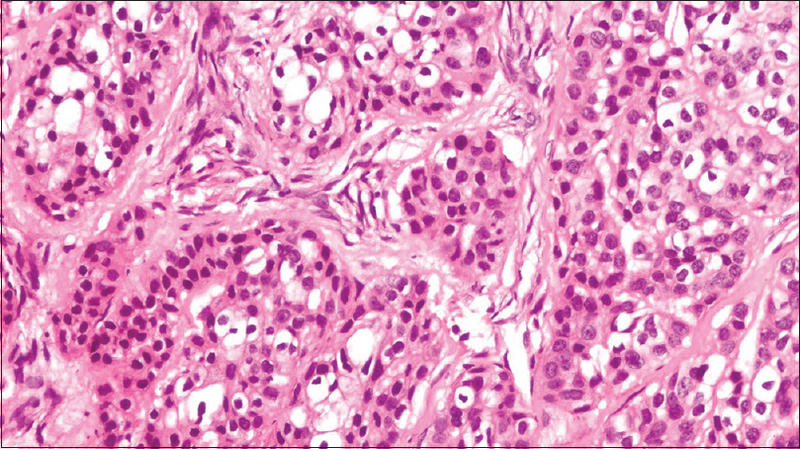 Reichart and Philipsen in 2003 considered it as a carcinoma. In WHO-2005 classification, it was denoted as malignant tumor due to its high potential for regional spread and distant metastases. Less than 100 cases are reported so far in the English literature. CCOC is a tumor of elderly with female predilection and mandibular localization. It is common in 5th–6th decade of life and with a female to male ratio of 2:1. It is three times more frequent in the mandible than maxilla and 75% of the cases are reported in mandible. CCOC may not present with specific clinical signs and symptoms. It is a slow-growing tumor associated with pain, ulceration and loosening of teeth. In our case, the patient was edentulous and presented with pus discharge and pain in the lower lip which is a varied clinical presentation. Imaging studies reveal poorly defined radiolucency often with root resorption and soft-tissue invasion. Three basic histological patterns are elucidated: monophasic/biphasic/ameloblastomatous. Biphasic pattern is the most common pattern comprising clear cells admixed with cells containing eosinophilic cytoplasm. The monophasic pattern is comprised of only clear cells, while the amelobalstomatous pattern is least common and resembles the cellular morphology of ameloblastoma. Mitochondria are swollen, show vacuolar transformation. Artifacts due to fixation and histologic techniques. In a tumor with clear cell morphology, it is very essential to broadly investigate the origin; whether it is odontogenic, salivary origin, or metastatic in nature. The overlapping histopathological features seen in odontogenic and salivary origin clear cell tumors result in dilemmas in the diagnosis,, [Table 2]. Ellis and Elizabeth et al. favored location as a criterion and suggested that the central osseous destruction seen with CCOC is supportive of odontogenic origin. Although nonspecific, markers such as AE1/AE3, EMA (epithelial membrane antigen) and CK 8, 14, 18 and 19 expressions have been narrated in the study of CCOC. Treatment of CCOC includes resection with a wide margin primarily. Other treatment modalities include curettage, enucleation, surgical resection with or without lymph node dissection and postoperative chemotherapy. Due to limited number of reported cases, definite assessment of prognostic factors in CCOC is precluded. However, lymph node metastasis, size, location and extent of the lesion may add on to the behavior and prognosis of the tumor. 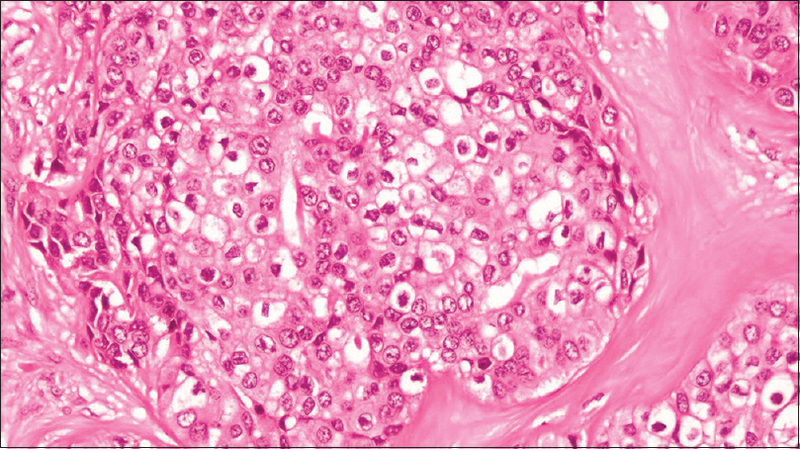 CCOC is a rare malignant odontogenic tumor with benign-looking histology. Considerable overlap may occur at microscopic and immunohistochemical levels between odontogenic and salivary clear cell entities. This is a first case of CCOC reported in a completely edentulous patient. CCOC stands out for two reasons: one, the diagnosis is by exclusion and second is its rarity. Although <100 cases are reported in the English literature, pathogenesis remains unclear. Diagnosis of the lesion is salient as it is a potentially aggressive tumor and is also capable of frequent recurrences and metastasis. Hansen LS, Eversole LR, Green TL, Powell NB. 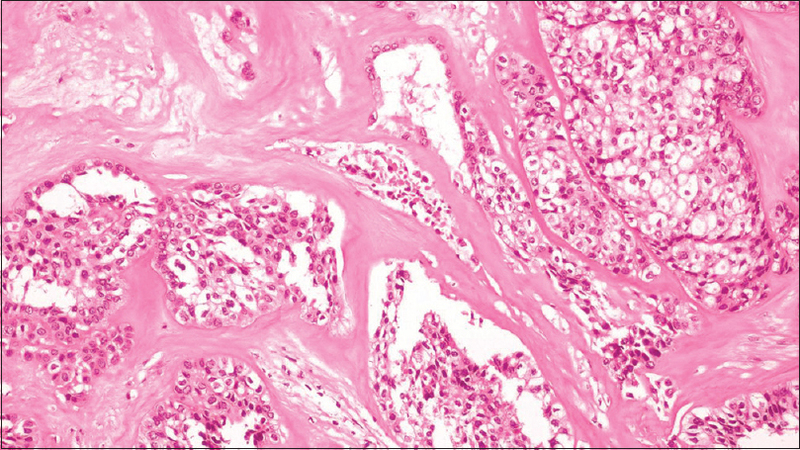 Clear cell odontogenic tumor – A new histologic variant with aggressive potential. Head Neck Surg 1985;8:115-23. Devaraju RR, Reddy S, Yashoda, Shekhar MS. Clear cell odontogenic carcinoma versus hyalinizing clear cell carcinoma: A diagnostic dilemma. J Indian Acad Oral Med Radiol 2014;26:319-22. El-Naggar AK, Chan JK, Grandis JR, Takata T, Slootweg PJ. WHO classification of Head and Neck Tumors (IARC WHO classification of Tumors) 4th edition. Lyon: IARC press; 2017. Siriwardena BS, Tilakaratne WM, Rajapaksha RM. Clear cell odontogenic carcinoma – A case report and review of literature. Int J Oral Maxillofac Surg 2004;33:512-4. Avninder S, Rakheja D, Bhatnagar A. Clear cell odontogenic carcinoma: A diagnostic and therapeutic dilemma. World J Surg Oncol 2006;4:91. Premalatha BR, Rao RS, Patil S, Neethi H. Clear cell tumours of the head and neck: An overview. World J Dent 2012;3:344-9. Jain A, Shetty DC, Juneja S, Narwal N. Molecular characterization of clear cell lesions of head and neck. J Clin Diagn Res 2016;10:ZE18-23. Swain N, Dhariwal R, Ray JG. Clear cell odontogenic carcinoma of maxilla: A case report and mini review. J Oral Maxillofac Pathol 2013;17:89-94. Kalsi AS, Williams SP, Shah KA, Fasanmade A. Clear cell odontogenic carcinoma: A rare neoplasm of the maxillary bone. J Oral Maxillofac Surg 2014;72:935-8. Ellis GL. 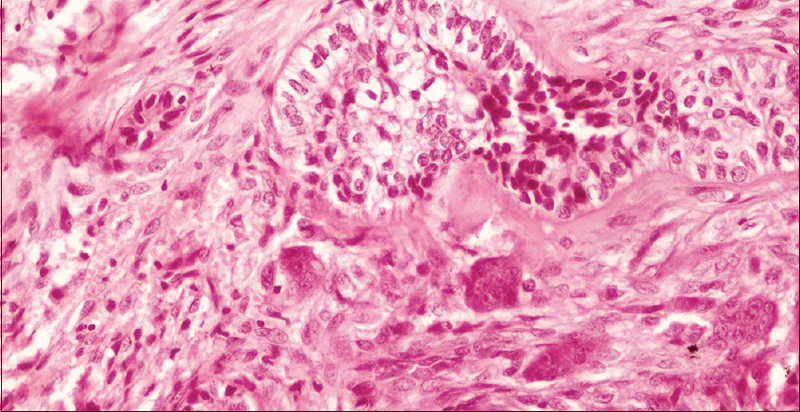 Clear cell neoplasms in salivary glands: Clearly a diagnostic challenge. Ann Diagn Pathol 1998;2:61-78.